DEVA Holding Çerkezköy II manufacturing facilities located at the 110 km distance to Istanbul, founded on an area of 67,551 m2 in Çerkezköy Organized Industrial Zone, with closed facilities of 18,742 m2, comprise of state-of-the-art manufacturing buildings where solid oncology, sterile liquid oncology, animal health products and APIs are manufactured. 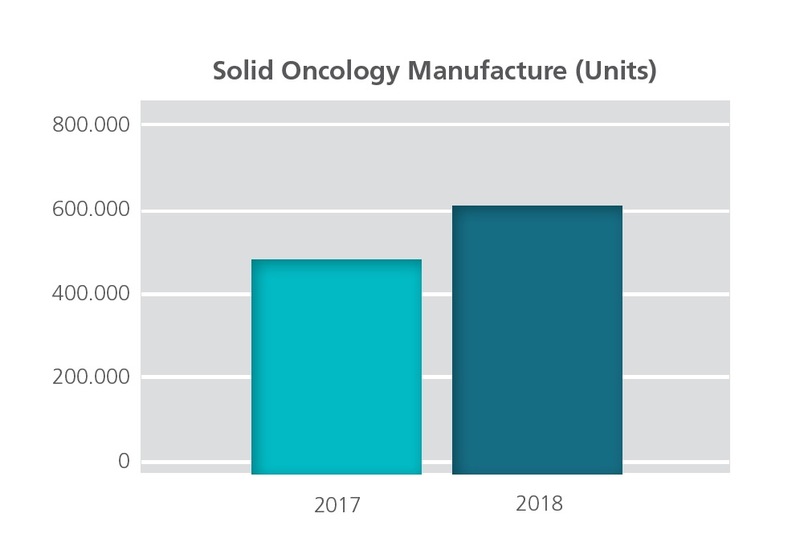 Products in tablet and capsule form are manufactured in the solid oncology manufacturing area. The total manufacturing quantity, which was 482,824 units in 2017, was 603,163 units with a 25% increase in 2018. Of the total of 603,163 units of products manufactured in 2018, 274,226 units were capsules and 328,937 units were tablets. In addition, of the 328,937 units of product manufactured in tablet form, 120,390 units were manufactured for the European market, and of the 274,226 capsules, 91,279 were manufactured for the US-American market. Products in sterile liquid and sterile lyophilized powder forms are manufactured in Sterile Liquid Oncology Manufacturing area. The manufacturing quantity of the area of 569,855 units in 2017 was 890,337 units in 2018 with a 56% increase. Of the 890,337 units of products, liquid products comprise 568,521 units and lyophilized products comprise 321,816 units. 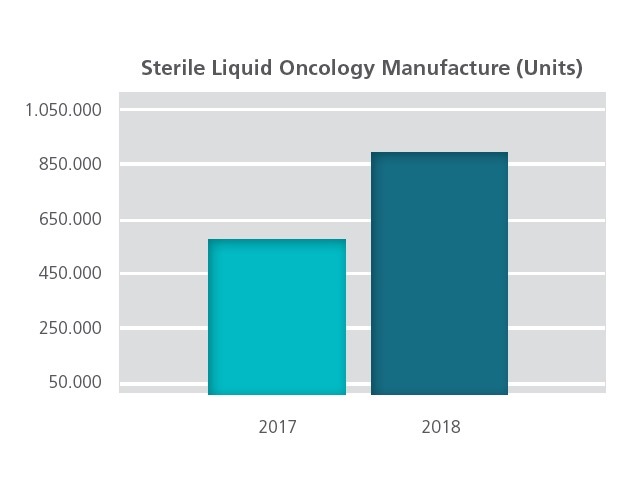 In 2018, in the Liquid Oncology department, the following products were manufactured and marketed for the first time. 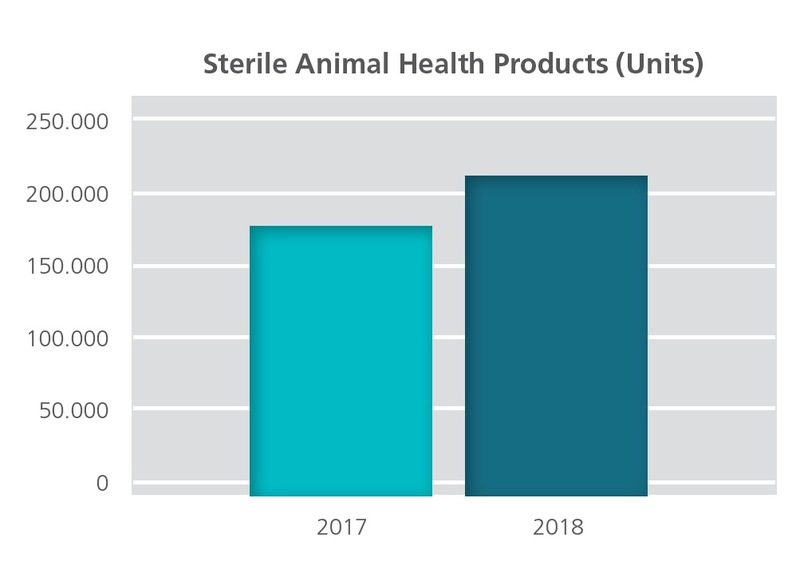 Products in sterile suspension and intramammary pomade form are manufactured in sterile animal health products manufacturing unit. The manufacturing quantity of the unit, which was 177,380 units in 2017, was 215,041 units in 2018, with a 21% increase. Of the 215,041 units of product, suspensions comprise 211,071 units and sterile intramammary pomade products comprise 3,970 units. 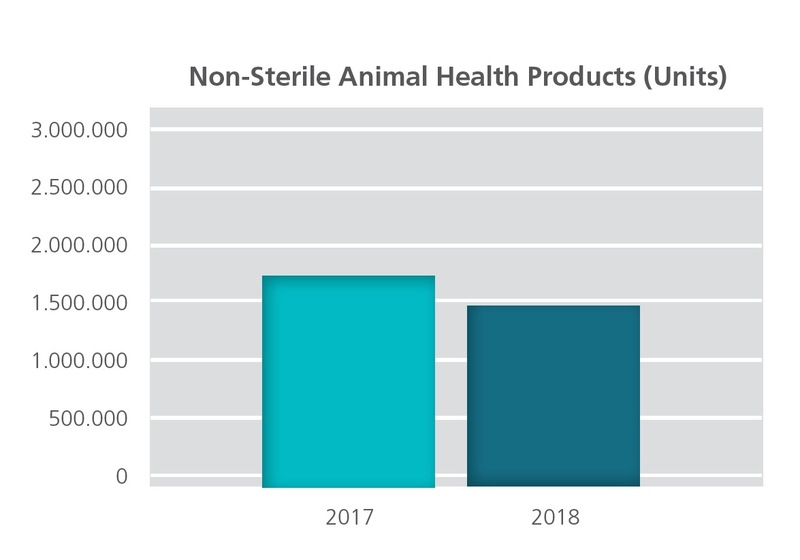 7 tablet-form products, 16 large and small powder fill-form products and 2 bag powder fill-form product are being produced in the non-sterile animal health products manufacturing area. This unit is divided into two subunits; non-betalactams and betalactams. While animal health products in tablet, powder and pouch form are manufactured in the non-betalactam area, products in powder form are manufactured in the betalactams area. The production output of the area was 1,731,356 units in 2017 and 1,478,543 units in 2018. Of these products, 1,299,322 units were tablets, and 179,221 units were powders. 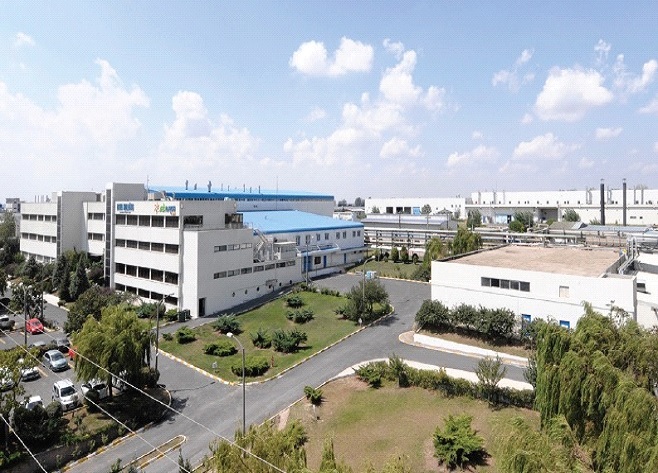 The facilities have four separate designated API manufacturing areas: non-betalactam API, betalactam non-sterile API, betalactam sterile API, and oncolytic API. 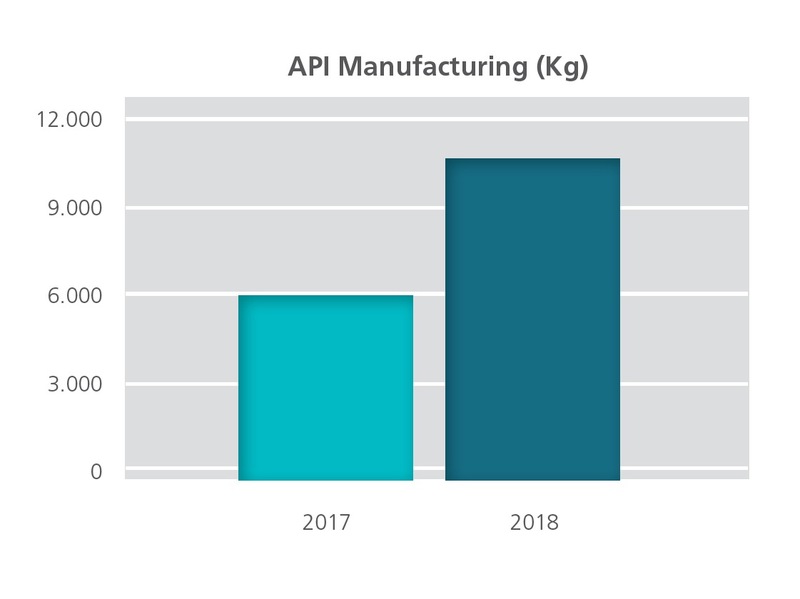 The API manufacturing quantity, which was 5,977 in 2017, was 10,742 in 2018, with an 80% increase. API productions are made according to internal and external customer demands. 20 different APIs are produced in non-betalactam, betalactam and oncology API production areas. Of the 10.742 kg of API produced in total in 2018, 9.523 kg was produced as non-betalactam, 1.104 kg as betalactam and 115 kg as oncology APIs. In 2018, validation production of the products Ricobendazole HCl and Indacaterol Maleate, and of the products Lenalidomide and Pomalidomide API were performed in the non-betalactam API production area, and in the Oncolytic API production area, respectively. In API manufacturing, the toxic gases arising from reaction are neutralized before being released to the atmosphere to minimize the environmental effects resulting from manufacturing activities. To summarize, finished products production output in DEVA Holding A.Ş. 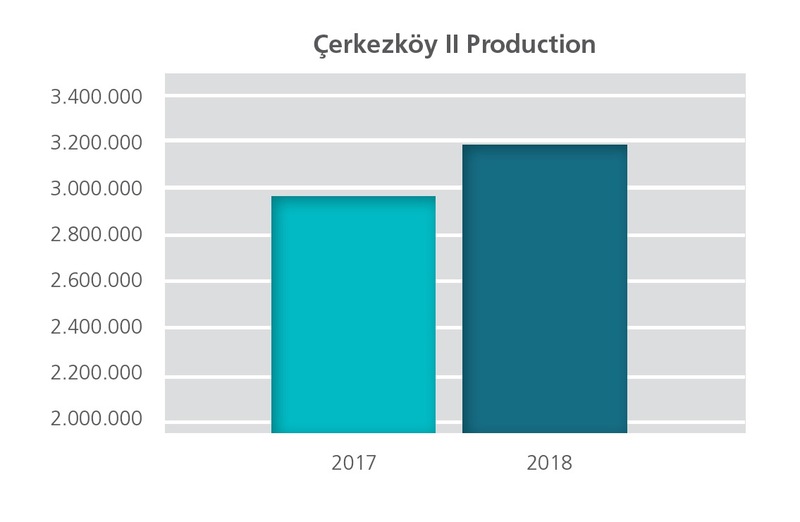 Çerkezköy II facilities increased by 8% from 2,961,433 units in 2017 to 3,187,084 units in 2018. The capacity utilization rate of Çerkezköy Main and API Manufacturing facilities is 74%.